FOR ALL MY years of cooking pasta, I still seem incapable of getting the measurements right – always having too little or (more often than not) way too much. Life is just too short to spend time measuring out pasta. But while you might think there’s little that can be done to salvage that leftover spaghetti or penne, we beg to differ. Reheated pasta can lose its bite and firm texture, so as soon as you realise you’ve made too much, run it under cold water, drain thoroughly and store in a ziplock bag in the fridge. There are plenty of ways to liven up any type of leftover pasta- check out our favourites below. Bacon and leek pasta bake: A pasta bake is a simple and tasty recipe to have on hand when you want a fuss-free midweek meal. To start, make a basic white sauce, stir in your favourite cheese, then add fried bacon and leeks. Stir in your leftover pasta, top with some grated cheese and bake for 20 minutes in a hot oven. This is unbelievably quick to put together and delicious served alongside a salad of rocket and tomatoes. Frittata: This is what many Italians do with their leftover pasta, so it’s guaranteed to be a good one! For the base, you just need 4 eggs, pasta and parmesan. From here, anything you have in the fridge could be added – peppers, sweetcorn or courgette for starters. Cook the frittata by mixing all of the ingredients together and frying in a pan, finishing it off with five minutes in a hot oven, or until the eggs have set. Serve hot from the oven or at room temperature for lunch the next day. Pasta salad: Now that we’re fast approaching that time of year again, it’s time to start thinking about school lunches – and this recipe makes for a great alternative to a sandwich. A favourite in my house is a chicken Caesar pasta salad which can be made in less than ten minutes. Simply slice up a cooked chicken breast and serve on a bed of cos lettuce leaves, cherry tomatoes and pasta, with Caesar dressing on the side. A little shaved parmesan will add that extra cheesy zing. 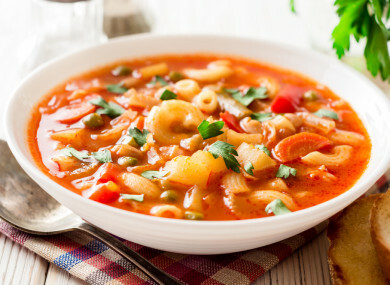 Minestrone soup: I adore minestrone soup, and only realised recently how easy it is to make. Start off by frying chopped onion, garlic, celery and finely diced carrots in a pot. Add a tin of chopped tomatoes, 300mls of chicken stock and simmer until the vegetables are soft. Stir in some cooked pasta at the end and add a dollop of pesto. Disclaimer: this is my take on a minestrone and may not be entirely authentic, but it is entirely delicious! Stir fry: Why not turn last night’s Italian leftovers into tonight’s Chinese! To make, heat some oil in a pan to a high heat, and add some crushed garlic, ginger and chilli. Add some shaved carrot, leftover spaghetti and toss until the mixture is thoroughly heated and well combined. Add a dash of soy sauce and serve alongside some fish or a sliced chicken breast. Are you thrifty with your pasta leftovers? Let us know your favourite recipes in the comments below. Email “What to do with... leftover cold pasta”. Feedback on “What to do with... leftover cold pasta”.